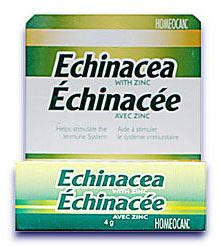 Echinacea has been tried for centuries as a stimulant to the immune system. Buy 1 for $6.00Buy 2 / Save $0.32!Buy 3 / Save $1.20! Its most common use today is for preventing colds and sore throats, orspeeding recovery from these infections. Scientific research withEchinacea confirms that it is a profound immune system stimulant,resulting in increased levels of white blood cells, the engulfing or destruction ofbacteria and viruses, antibody activity, natural killer cell activity andcan therefore prevent the establishment and spread of infections. Allow 3 to 4 pellets to dissolve in mouth three times a day or as directed by a health professional.Children under 12: Take 1/2 the adult dose. Do not exceed recommended Dosage. Echinecea puprea Herba 6X, Echinecea purpurea Herba 12X, Echinecea purpurea radix 6X, Echinecea purpurea Radix 12X, Zincum Met. (Zinc) 10X. Do not use if cap seal is broken. Keep out of reach of children. If you are pregnant or nursing a baby, seek the advice of a health professional before using this product. If symptoms persist or worson, discontinue use and contact a health proffesional.